My name is Andrew Kelsall, a Graphic Designer who works for projects mainly in the UK, America and Australia. I predominantly design logos, CD sleeves and posters─as well as unique large format projects. I operate worldwide from my home studio, based near Leeds, England. 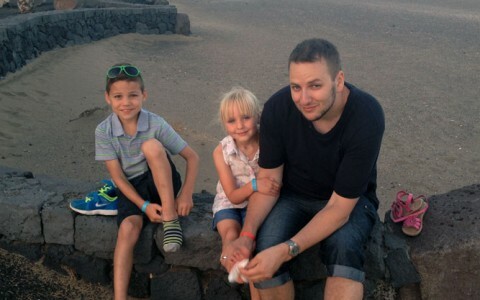 Here’s me with my 2 kids below from a holiday in Spain (on the left). As a Qualified BA Graduate from the prestigious Coventry University School of Art & Design, England, I worked for several design companies before becoming an independent graphic designer back in 2003. Short Bio: I am a Christian, family-man with a wife, 2 kids, dog─and 3 guinea pigs! I’m a Creative Designer, problem-solver and Mac-user. I like to watch Sci-fi and documentaries, as well as keeping an eye on current affairs and World News. My Design Style: To see what my designs are like, please check out my portfolio. Here, you can see a variety of the projects I’ve worked on, as well as links to other articles I’ve written that show my work processes. For example, see my posts on my Families Outreach Logo, CD Sleeve for Peter Webster and my Poster and Leaflet Designs for St. Peter’s Church. If you would like me to work on a project for you, please contact me by filling out the simple form below. If you have plenty of details on-hand, you could use the main Hire-Me form instead. Note: Your Email address will be kept 100% Private. Always.